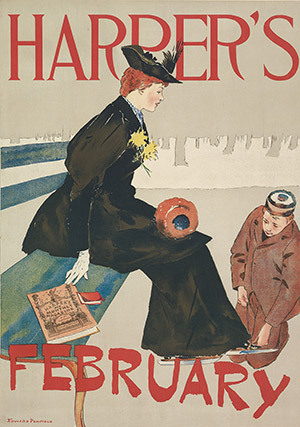 [Poster for Harper’s New Monthly Magazine, Jan 1894]. 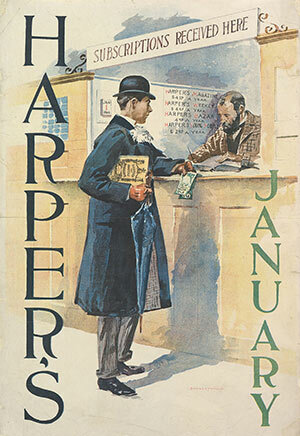 Man paying for Harper’s at subscription counter. Four-color lithograph: yellow, red, blue and black. New York: Harper & Brothers, published Dec 1893. Signed lower right: EDWARD PENFIELD. 11 7/8" w. x 17 1/4" h.
Ref: Union, 78; Quincy, 145; MCMA, 226; Whitehead, pg 36; DFP, 328; Lauder, 146. 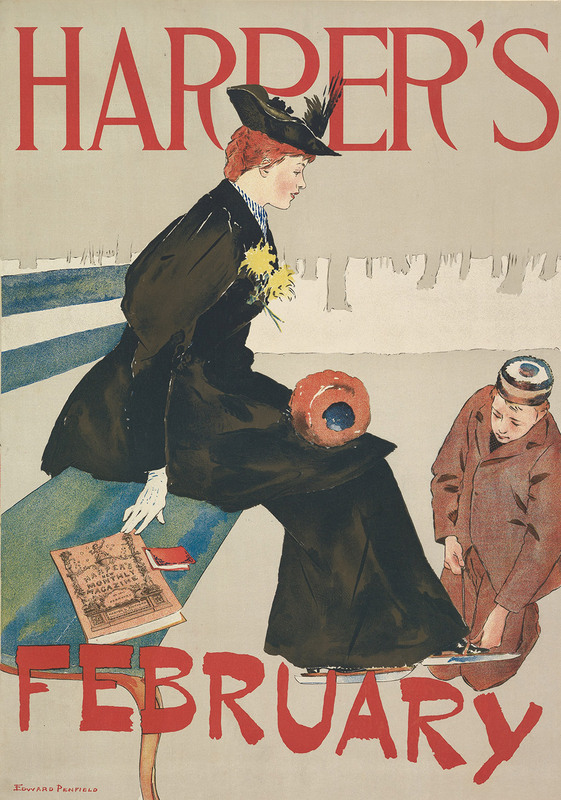 [Poster for Harper’s New Monthly Magazine, Feb 1894]. Seated woman on park bench, being fitted for ice skates. Five-color lithograph: grey, yellow, red, blue and dark brown. New York: Harper & Brothers, published Jan 1894. Signed bottom left: EDWARD PENFIELD. 11 1/4" w. x 16" h.
Ref: Union, 79; Quincy, 146; MCMA, 227; Whitehead, pg 36; DFP, 329; Lauder, 147. 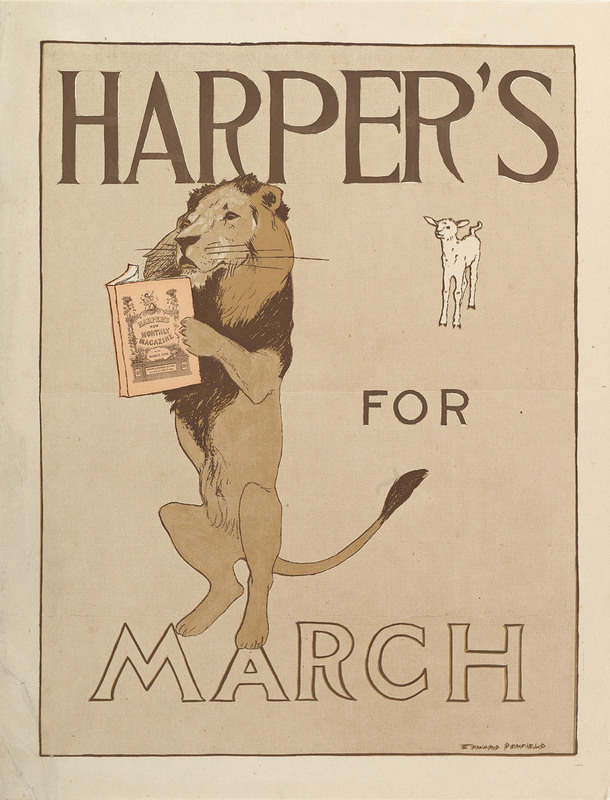 [Poster for Harper’s New Monthly Magazine, Mar 1894]. Lion reading, with lamb watching. Three-color lithograph: orange, light brown and dark brown. 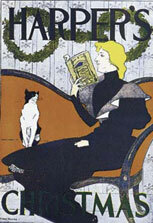 New York: Harper & Brothers, published Feb 1894. Signed bottom right: EDWARD PENFIELD. 13 7/8" w. x 19 3/8" h.
Ref: Union, 80; Quincy, 147; MCMA, 228; Whitehead, pg 36; DFP, 330; Margolin, pg 30; Lauder, 148; PAI-34, 95. [Poster for Harper’s New Monthly Magazine, Apr 1894]. 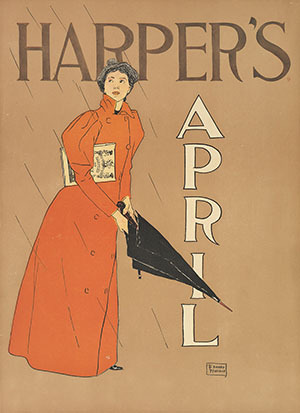 Woman with Harper’s standung in an April shower, opening umbrella. Four-color lithograph: vermilion, yellow, grey-brown and black. New York: Harper & Brothers, published Mar 1894. Signed lower right: EDWARD | PENFIELD enclosed in box. 12 5/8" w x 17 3/4" h.
A companion piece to Penfield's design for April, 1893 (A 2). Ref: La Plume, pg 424; DFP, 331. [Poster for Harper’s New Monthly Magazine, May 1894]. Woman with Harper’s observing birds’ nest. Three-color lithograph: blue, yellow and vermilion. New York: Harper & Brothers, published Apr 1894. Signed lower right: EDWARD | PENFIELD. 13 3/16" w. x 16 1/4" h.
Ref: La Plume, pg 443; Union, 83; Bolton, pg 11; Quincy, 148; MCMA, 230; Whitehead, pg 36; DFP, 332; Lauder, 149. 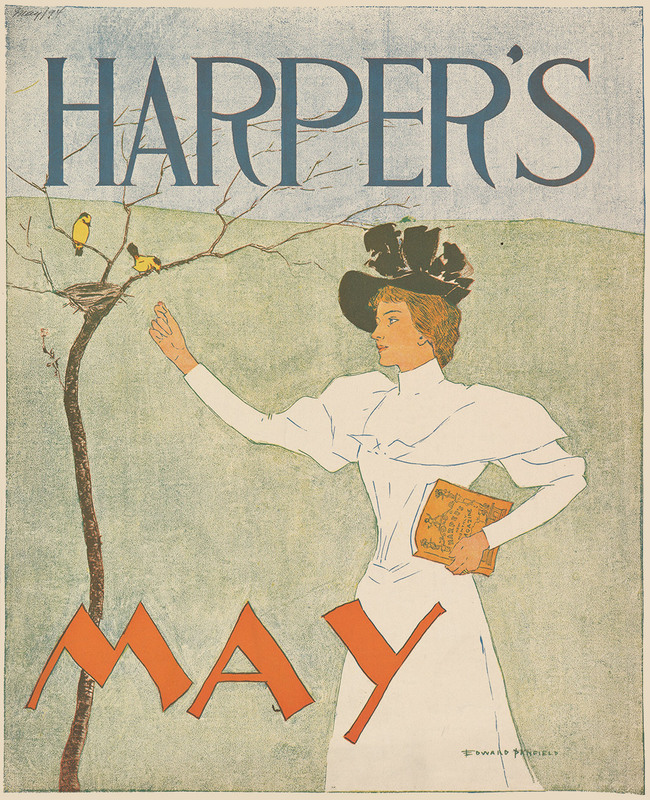 [Poster for Harper’s New Monthly Magazine, Jun 1894]. Couple rowing in canoe. Three-color lithograph: blue, yellow and red. New York: Harper & Brothers, published May 1894. Signed lower left: EDWARD | PENFIELD. 13" w. x 16 7/8" h.
“The couple are rowing on the Harlem River; the High Bridge is in front of them,” noted David Kiehl in American art posters of the 1890s. Using only three ink colors, Penfield and his pressmen managed to combine and overprint them to great effect. Ref: Union, 85; Bolton, pg 11; Quincy, 152; Hiatt, pg 287; MCMA, 231; Whitehead, pg 36; Echo, 328; DFP, 333; Lauder, 150. 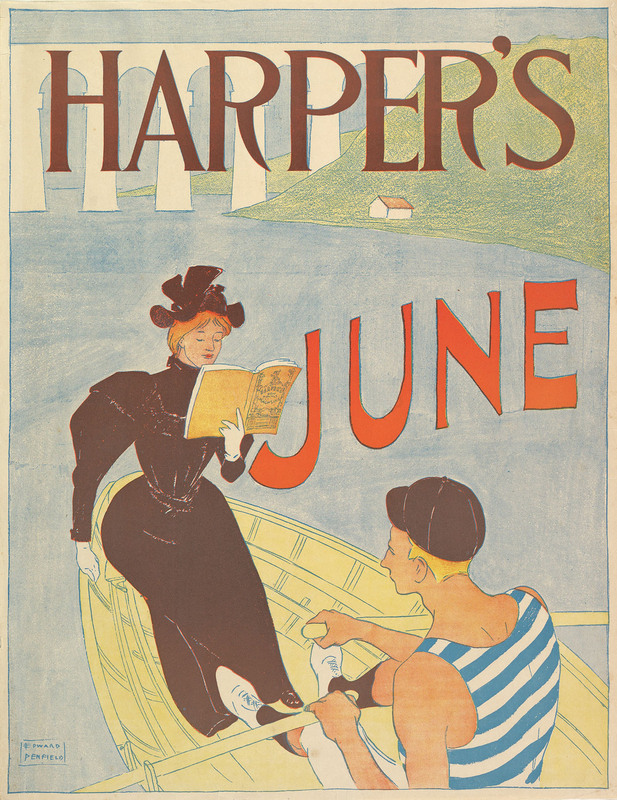 [Poster for Harper’s New Monthly Magazine, Jul 1894]. 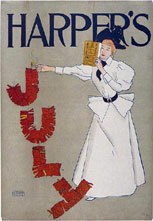 Woman reading Harper’s, lighting July firecrackers. Three-color lithograph: light brown, blue and yellow. 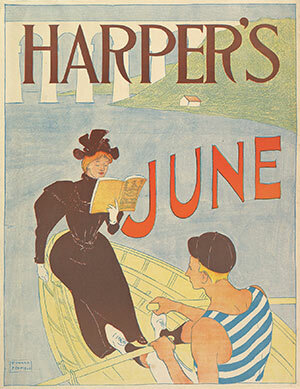 New York: Harper & Brothers, published Jun 1894. Signed lower left: EDWARD | PENFIELD. 12 5/8" w. x 18" h.
Ref: Bolton, pg 11; Quincy, 153; Hiatt, pg 288; MCMA, 232; Whitehead, pg 36; Echo, 329; Reims, 1254; La Forgue, pg 154; Sponsel, pg 207; DFP, 334; Margolin, pg 30; Lauder, 151. [Poster for Harper’s New Monthly Magazine, Aug 1894]. Pale woman with Harper’s, renting a bathing suit at a beach booth. Four-color lithograph: yellow, blue, red and black. New York: Harper & Brothers, published Jul 1894. Signed bottom right: EDWARD | PENFIELD. 12 5/8" w. x 16 3/4" h.
Ref: Union, 88; Bolton, pg 11; MCMA, 233; Whitehead, pg 36; DFP, 335; Lauder, 152; PAI-14, 402; PAI-27, 555. [Proof-print for Harper’s New Monthly Magazine, Aug 1894]. Two-color lithographic proof: vermilion and black. New York: Harper & Brothers, published Jul 1894. Signed bottom right: EDWARD | PENFIELD. 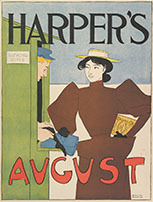 [Poster for Harper’s New Monthly Magazine, Sep 1894]. 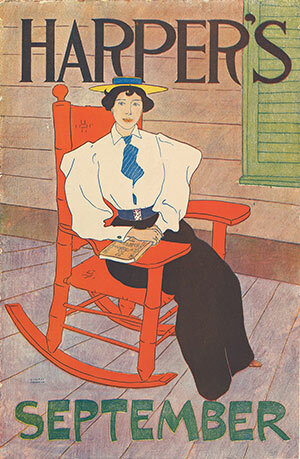 Woman on porch in a red rocker. Three-color lithograph: blue, yellow and red. 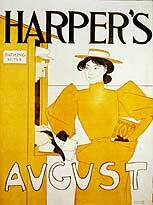 New York: Harper & Brothers, published Sep 1894. Signed lower left: EDWARD | PENFIELD. 10 5/8" w. x 16 7/16" h.
Ref: Union, 90; Bolton, pg 11; Quincy, 155; La Plume, pg 443; MCMA, 234; Whitehead, pg 36; Echo, 330; Reims, 1255; Lauder, 153; PAI-15, 460. Variation a: rocking chair without cane weaving patterns on side edge of seat, or near woman’s neck. Ref: DFP, 336; Lauder, pg 142. 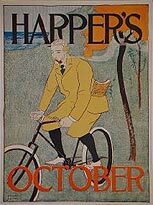 [Poster for Harper’s New Monthly Magazine, Oct 1894]. Male biker with pipe. Three-color lithograph: blue, yellow and red. New York: Harper & Brothers, published Sep 1894. Signed bottom left: EDWARD | PENFIELD. 13 1/4" w. x 17 3/4" h.
Ref: Union, 93; Bolton, pg 11; La Plume, pg 429; MCMA, 235; Whitehead, pg 36; Echo, 331; DFP, 337; Hawkes, pg 7; Lauder, 154; PAI-9, 437; PAI-10, 355. 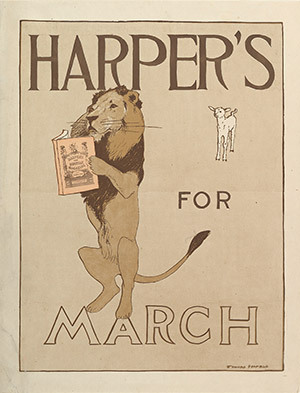 [Poster for Harper’s New Monthly Magazine, Nov 1894]. 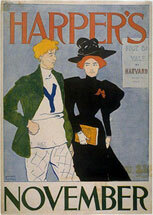 Yale man and woman passing Harvard football poster. Three-color lithograph: blue, yellow and dark red. New York: Harper & Brothers, published Oct 1894. Signed lower left: EDWARD | PENFIELD. 12 11/16" w. x 18" h.
Ref: Union, 95; Bolton, pg 11; La Plume, pg 438; MCMA, 236; Whitehead, pg 36; Echo, 332; DFP, 338; Lauder, 155. [Poster for Harper’s New Monthly Magazine, Dec 1894]. Woman on sofa with cat. Three-color lithograph: blue, yellow and red. New York: Harper & Brothers, published Nov 1894. Signed lower left: EDWARD | PENFIELD. 12 1/2" w. x 18 1/4" h.
Ref: Union, 96; Bolton, pg 11; MCMA, 237; Whitehead, pg 36; Echo, 333; Reims, 1256; DFP, 339; Hawkes, pg 7; Johnson, 232; Lauder, 156; PAI-15, 461; PAI-20, 370; PAI-34, 96.